Transparency Market Research (TMR) observes, the global edge computing market is highly competitive due to presence of number of companies operating in the market. Some of the key players operating in the global edge computing market are Microsoft Corporation, Cisco Systems Inc., IBM Corporation, Google Inc., and Hewlett Packard Enterprise Company. These players are increasingly taking initiatives for technological advancements. The launch of advanced technology is expected to fuel growth of the market and help players to gain higher revenue. A report estimates, the global edge computing market was evaluated at US$8,024.5 mn in 2017 and is expected to attain value of US$13,313.7 mn by the end of 2022 with the CAGR of 10.7%. Based on component, hardware segment is anticipated to account for the leading share of 54.3% of the market in 2017 and remain dominant over the forecast period by progressing with a CAGR of 10%. Based on geography, North America is projected to dominate the global edge computing market in 2017, and is expected to remain dominant over the forecast period. IoT data is increasing substantially due to introduction of products such as smart devices, smart glasses, and smart watches. Edge computing technique aids for processing, collection, and collection of IoT-generated data. Moreover, rise in number of internet users and growing adoption of digital services is leading to increase in the collection of volume of sensitive data of numerous organizations. These factors are boosting growth of the edge computing market owing to increase in data is expected to propel growth of the edge computing market. Additionally, edge computing is technology of improving the cloud computing systems by processing data at edge of network and near about the source of data. The edge computing reduces the time for operation and complete process in milliseconds which helps in the reduction of work load on the other networks. Thus, the adoption of the edge computing is higher which is propelling growth of the market. Furthermore, transmission of amount of loads which leads to create the remarkable load on the network. This factor is expected to boost adoption of edge computing over the forecast period. Edge computing technique processes data from source and analyze the data and sends the valuable information; thus, its adoption is higher. These are some factors driving growth of the global edge computing market. 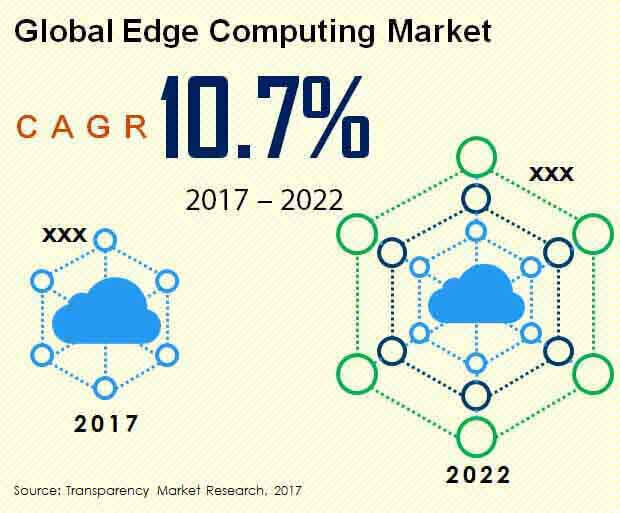 Despite of these factors, the market is facing some challenges including complex configuration is expected to restraint growth of edge computing market. In addition, risks of security holes and cyber security due to habit of not changing passwords. Also, these devices highly susceptible to cyber terrorism which is limiting growth of the edge computing market. Nonetheless, advancements in technology and growing adoption of technologies such as 3G, and 4G globally in the long-term evolution (LTE) wireless networks are propelling demand for IoT technologies. Also, these are expected to offer lucrative opportunities over the forecast period.